The snow is falling and I have planned several ski trips with my ski club this winter. I am looking forward to a white Christmas. I wish you all a Merry Christmas and I hope you enjoy fun activities with your family and friends this holiday season. Friends of Science had a recent, successful fund raising program that has restored funds to our account, allowing us to plan further activities that otherwise might not have occurred. Thank you to all those who have recently donated. In particular, we have lined up two speakers for our major event on May 15, 2018, Dr. Madhav Khandekar, an expert on extreme weather and monsoons, and Marijn Poels, Producer and narrator of the documentary “The Uncertainty Has Settled” that exposes the impact of climate policies in Europe. Mark the date on your calendar. We encourage you to share our blog, Facebook and videos postings. Our blog has 37 insightful posting so far this quarter. Many thanks to Robert Lyman and Michelle Stirling, who contributed many of these articles. The blog received almost 10,000 visitors per month. I counted 115 postings on our Facebook page so far in December. That is a remarkable level of activity. Get in on the action and fun by commenting on our blog and Facebook page. Our YouTube page has six new video this quarter, including four videos featuring Steve Goreham who was one of our guest speakers at our major event last May. See also an interview with Dr. Khandekar and a video challenging Minister McKenna on coal. We were saddened to learn that Dr. John D. Harper, P.Geol., former director of the Geological Survey of Canada, a speaker for Friends of Science and one of our scientific advisors, passed away on October 24, 2017. He was a guest speaker at the Friends of Science May 10, 2016 major event “Climate Leadership Catastrophe: Carbon Taxes, Job Loss, Freedoms Denied”. Dr. Harper’s presentation “From Ice Age to Nice Age to Dry Age and Back: 600 million years of Climate Change” is online: https://youtu.be/O-mMpGBxPwI as are many of his shorter videos on our YouTube channel. He was a great man and a wonderful professional. Myself and all the team at Friends of Science wish you all a Merry Christmas. I hope you enjoy fun activities with your family and friends this holiday season. Looking forward to the New Year and providing you with more thoughtful climate science and policy insights. This year’s annual climate conference took place in Bonn, the home of the UN Framework Convention on Climate Change (UNFCCC), with Fiji acting as the presiding country. The conference consisted of six sections and negotiating bodies, each with its own acronym (followed by the body’s meeting number) and conference webpage: COP 23 (Conference of Parties to the UNFCCC); CMP 23 (Conference of Members of the Kyoto Protocol); CMA 1.2 (Conference of Members of the Paris Agreement); SBSTA 47,( Subsidiary Body for Scientific and Technological Advice); SBI 47 (Subsidiary Body for Implementation); and APA 1.4 (Ad hoc Working Group on the Paris Agreement). Only COP and APA really matter. Carbon Brief gives a complete, if one-sided, view of the outcomes of the conference. Notably, there were two US delegations. The official one kept a low profile, except when they got heckled for a clean coal presentation. (Ironically, in reductions of CO2 emissions and coal use during this century, the US by far exceeds that of any other country.) The other US delegation, a coalition of US cities, states and companies called “We Are Still In” and claiming to represent half the US economy, set up a large pavilion outside the main venue for the talks. This group issued America’s Pledge to support the Paris Agreement, despite the Trump administration’s notice to withdraw from it. Another major event was the launch of the Powering Past Coal Alliance, led by the UK and Canada. The alliance wants to phase out coal power in rich countries by 2030 and the rest of the world by 2050. Its list of 25 members excludes any jurisdictions with significant coal power usage (e.g., Germany, Poland, Australia, China and India). One of two sponsors, Canada, is a nobody in the global coal business. Germany’s chancellor defended her country’s use of coal and the need to preserve jobs in industry. Pre-2020 climate action was the fourth major event. This centered on concerns that rich countries haven’t done enough to meet the $100 billion/year by 2020 promised at the 2009 conference, as well as more emission-reduction commitments before the Paris Agreement pledges kick in after 2020. The final COP 23 text recognizes these concerns in paragraphs 12 to 20. Carbon Brief’s article concludes with a table of key dates leading up to COP 24 in Katowice, Poland, December 3-14, 2018. Katowice is located deep in Europe’s coal heartland, which combined with Poland presiding over the conference, concerns climate activists. The Friends of Science December 2016 newsletter described the Alberta government’s competitive bidding process for an initial 400 MW of renewable power (i.e., wind or solar). On December 13, 2017 the government, through the Alberta Electric System Operator (AESO), announced the results of the process. Twelve companies submitted bids for 26 projects. The winners were four projects, from three companies as shown in this figure on the right that summarizes the four most successful projects. All the projects are wind generators, located in the south of the province and will be able to connect to the existing transmission system. They have to be in service by December 2019. Because of the unexpectedly low bid prices (a weighted average of $37/MWh, or 3.7¢/kWh) the government accepted a total of 596 MW of capacity. 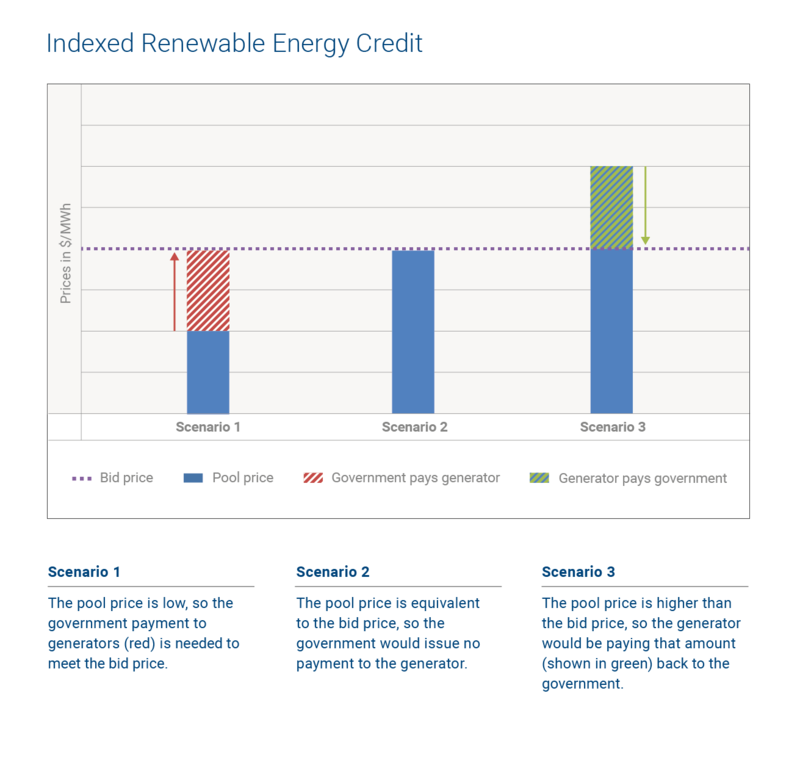 Under the Indexed Renewable Energy Credit, each generator’s bid price will be compared to the province’s pool price when power is produced. If the pool price is less than the generator’s bid price the government guarantees the generator’s bid price. If the pool price is greater than the bid price, the generator pays the surplus to the government. Thus, each wind generator is guaranteed its bid price, but no more. Currently, the pool price is about $20/MWh. The AESO website makes no mention of preferential access to the grid for these wind projects. This presumably means that the market will continue to function as it does now, whereby generators of all types offer power at asking prices on an hourly basis, and AESO starts with the lowest-priced offers and working upwards until the demand for power is met. That is, there’s no Ontario-style feed-in tariff, whereby that province’s Independent Electricity System Operator has to accept any power offered by an approved renewable generator. If there’s too much power flowing into the grid the IESO has to dump the excess wherever it can at a loss. Also, Ontario’s new price schedule for wind power is 11.5¢/kWh, which is 3.1 times the 3.7¢/kWh weighted average of the four Alberta projects. However, by 2019, Alberta is slated to go to a ‘capacity’ market, explained in this AESO FAQ. A 2012 report to the Market Surveillance Authority showed that power prices in Alberta were too low to attract wind or solar investors. The results of the initial auction appear to be a good omen for the Alberta government’s plan to build an eventual 5,000 MW of renewable power. However, as this article by Friends of Science Communications Manager, Michelle Stirling, points out: future auctions will likely be higher than $37/MWh; there will be costs to connect future projects to the grid; since wind power is intermittent additional natural gas backup (and base load) plants will be needed as the existing coal plants are shut down. Thus, the effect of a large-scale implementation of renewable power in Alberta will be a tripling of wholesale power prices as forecast by the National Bank August 2017 report “Winter is Coming” and confirmed by AESO representatives at the CSEM luncheon Dec. 11, 2017. This section of this newsletter usually reports on papers that tells us something interesting about climate. It is also important to rebut papers that report things that aren’t true. An influential paper titled “Greater Future Global Warming Inferred From Earth’s Recent Energy Budget” was published in the journal Nature this month. A story on the paper “The Most Accurate Climate Change Models Predict the Most Alarming Consequences” was published by the Washington Post, and republished by numerous newspapers including the Calgary Herald. The paper claimed to use recent observations to show that the climate models that most closely matched the observations produced the most alarming temperature predictions, so we can expect more warming than that predicted by the average of the climate models. The paper utilized advanced statistical methods, data from the CERES satellite that measures the top-of-atmosphere energy fluxes and compared them to the models. Climatologist Nic Lewis reviewed the paper and found it was well written with the data and code archived. The problem is that the paper is “seriously flawed” and the data does not support the authors’ conclusions. The paper used satellite data from 2001 to 2015. In that period the surface temperature best fit trend from the UK Met Office (HadCRUT4.5) was 0.093 °C/decade. 2015 was an El Nino year, so the data ends with an uptick, biasing the trend line high. The trend over the same period from satellite data of the lower troposphere (UAH6.0) was 0.007 °C/decade. The climate model trend of 0.202 °C/decade is much higher. According the models the surface trend is supposed to be less than the satellite trend, but it isn’t, likely due to urban warming. This huge discrepancy suggests that the models are running too hot! But the paper didn’t comparing actual trends over time of the model simulations to observations. The paper used the top-of-atmosphere outgoing long wave radiation (OLR), the solar reflected and the net incoming radiation in the study. The authors compared the mean, the magnitude of the seasonal cycle and the monthly variability of the measured fluxes to that of the climate models. They used theses relationship to make a prediction of temperatures in 2090 and compared that to the modelled predictions. Using the IPCC’s extremely high emissions scenario (RCP8.5), they predicted temperatures 13.9% higher than the models by 2090, and for the press release they rounded that up to 15%. So what’s wrong with that? Two things. First, there is no reason to believe that a model that gets the seasonal cycle of the radiation fluxes slightly more accurate than another tells us anything at all about how accurate that model would be in estimating greenhouse gas induced warming over a century time scale. Only the long term effects of increasing GHG matter, not the seasonal cycle or monthly variations. Second, their result uses the average of the three attributes of the three fluxes, so nine measurements (for each grid cell), but their data shows that just using one of them, the OLR seasonal signal, gives a better match, that is, has twice the skill, of using the average of the nine measures. Adding the other eight measures is supposed to improve the skill, not make it worse, so only the one measure means anything. Nic Lewis write, “The RCP8.5 2090 Prediction ratio using the OLR seasonal cycle predictor is under half that using all predictors – it implies a 6% uplift in projected warming, not “about 15%”. Using the tropics, where the signal is strongest, the skill improves further, reducing the predicted warming uplift to “a trivial 3% uplift.” Using the authors’ methods, the papers results and conclusions are not supported by the data. But do the results confirm the models predictions? No, as per the second previous paragraph. Lewis says it is invalid to assume the relationship of future warming to certain very short term aspects of the recent climate that holds in climate models also applies in the real climate system. Lewis makes a further observation that some climate model control runs with constant temperatures (no warming) has non-zero net forcing, which violates the first law the thermodynamics. The paper adds to a long list of junk climate science published by the journal Nature. The mainstream media is full of horror stories of sea level rise due to greenhouse gas emissions and climate change that will submerge small island nations and coastal cities, and that extreme weather will become more severe. Damages due to these events are estimated by scientists who develop complex computer models called Integrated Assessment Models (IAM), which have climate components and damages components. By far, the most sophisticated IAM is the “Climate Framework for Uncertainty, Negotiation and Distribution” (FUND) model. Ian Cameron discusses some results from FUND in the September 2017 newsletter. The damages in FUND depend on the greenhouse gas emissions assumed and the sensitivity of the climate to those emissions. Here I use the default emissions in FUND which increases the CO2 concentration from 407 ppm in 2017 to 800 ppm is 2100. The CO2 growth increases from 0.55%/year in 2017 to 0.94%/year in 2100, which requires a huge increase in emissions. Assuming a realistic equilibrium climate sensitivity of 1.0 °C for a doubling of CO2, the FUND model estimates the global sea level rise impact at the year 2100 relative to today of US$37 billion, and the impact of storms is only US$14 billion. These numbers can be put in perspective by comparing to the Gross World Product in 2100. In the year 2100, assuming CO2 concentrations nearly doubles by then, sea level rise will have the effect of reducing global wealth by 0.013% and storms will reduce global wealth by 0.005%, giving a combined effect of reducing wealth by 0.018%. If your income is $50,000 per year, this is equivalent to losing $9.05 per year. But what if CO2 increases only exponentially at the current growth rate of 0.55%/year? Then by 2100 the loss is equivalent to losing $5.15/year, which is insignificant. Who polices global Geo-engineering initiatives anyways? It turns out that the UN does. At the tenth meeting of the Conference of Parties (COP) in Nagoya Japan in October 2010 the Convention on Biological Diversity (CBD) adopted decision X/33 which in paragraph 8 (w) and (x) includes a section on climate-related geo-engineering and its impacts on the achievement of the objectives of the CBD. They are very specific “that no climate-related geo-engineering activities that may affect biodiversity take place, until there is an adequate scientific basis on which to justify such activities and appropriate consideration of the associated risks for the environment and biodiversity and associated social, economic and cultural impacts”. Enough said. The problem is clear; we have another regulatory alphabet soup of committees that have created a set of essentially reasonable guiding principles that have no teeth. It is imperative that we, as citizens of this blue marble, speak out against engineering projects that can do more harm than good. To be clear I am not referring to projects that mitigate loss of life or property damages on a local scale. Holland’s extensive storm surge floodgates are a perfect example of brilliant engineering that mitigates local weather related problems and naturally varying sea levels. I shamelessly refer you to my blog post (link needs to be updated) for all the details and in depth analysis. Spoiler alert, these two projects are likely to be environmental disasters. In mid-November you likely saw our “Important Message” email where we laid out our meagre financial status. Our letter clearly stated we had a funding dilemma. Confidentially we told you that our bank funds would only sustain us for a couple of more months and then we would be forced to go quiet. As you are all aware we function purely from your donations. We do not represent any industry or political party. We are a Society that was started in 2002 to provide climate science and policy insights to the public and policy-makers. Our founders saw climate science as a complex, interdisciplinary issue that was being reduced to a mantra of carbon dioxide and carbon taxes – and that real problems related to environment and climate change were being ignored. Real, destructive implications of these policies were lost in the rhetoric of ‘saving the planet’ – while devastating the people and the economy. We are a small group primarily of volunteers that works with an operational budget that is a fraction of the governments’ or NGO budgets that disseminate the fear mongering of human induced climate change. We are committed to maintaining free delivery of our information to the public. We are happy to inform you that our email resonated with you and we received an early Christmas present from many of you. To all of you that donated we thank you for your generous support. We are now able to report that we have the funds to plan our popular annual spring speaker event. Many of you also told us that you did not know how dire our situation was and you thought “all was good”. To this end we are introducing the new graphic shown here on the right so in each newsletter you will be able to gauge where we stand. As you can see we are now fuelled for the first two quarters of 2018. However, to maintain our spokesperson Michelle and our contracted administration and sub-contracted services through all of next year we will need more donations. Every dollar counts towards keeping us focused on the task of bringing you the latest climate information. So as we are not fully funded for 2018 we appeal to you to please continue to make donations to Friends of Science. Share our materials by email, tweet, Facebook or any way you can. We can be a voice for your climate change issues – and we thank all of you who have given us tips on the misinformation they see in the marketplace. We have made aggressive outreach efforts with short, current commentaries on video, through our blogs and billboards. We need 'all hands on deck' in the new year, as the IPCC will be holding a conference in Edmonton in the spring of 2018. This will be challenging for us - but it will also raise our profile and provide many opportunities to respond and call out the ideological side on their lack of due diligence.